Police in Roseville, Michigan is looking for several black suspects who viciously assaulted a bowling alley employee. Roseville Police Department issued a public statement regarding the assault and information of the suspects. 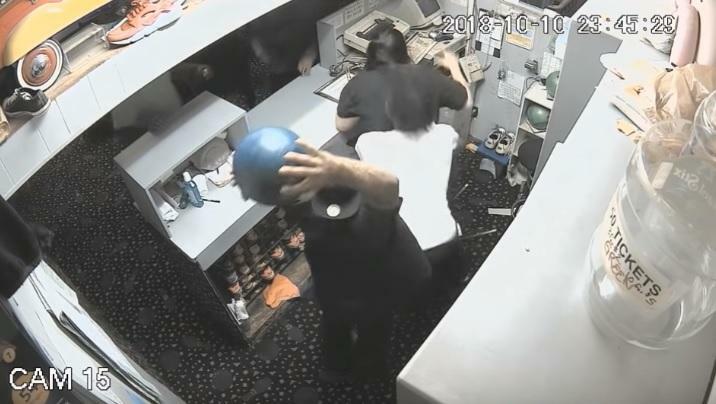 A video of the incident shows a vicious beating and a full overhead swing of a bowling ball to the back of the employee's head. The whole incident was started by the black suspects according to the Roseville Police Department who said the bowling alley employee was forced to ask them to leave when they became unruly. The bowling alley says that the suspects became unruly and when the employee behind the counter asked them to leave they came behind the counter and beat him with a bowling ball. The violence of these thugs is disgusting to see when you consider how many of them probably have Obama phones while the poor Bowling Alley employee was just trying to do their job. The unruly BLM NPCs began beating and kicking the bowling alley employee even after he had been knocked to the ground by the bowling ball attack. These suspects should be charged with assault with a deadly weapon since a bowling ball could easily kill someone if crushed on their skull. If you have any information about the identities of these BLM NPCs please call the number for the Roseville Police Department listed above. They are dangerous and until held accountable for the vicious assault should not be approached. How do you know they're BLM? It's B / M for black, male, not BLM. Just saying….not trying to be rude. We should look the other way here. Because after all, they were likely Liberal-Democrat raised..
please tell me that these disgusting THUGS are getting charged with attempted murder! And "they" wonder why we treat them like monkeys! !